Just as this First Blood (1982) pastiche is kicking into gear, it transpires that Frank falls in love with Beatriz (Socas), a woman from the war-torn third-world country San Florian. Since he is a pilot, he agrees to fly the woman from Texas to San Florian with a lot of weaponry. She intends to free her father who has been kidnapped by the revolutionaries. Can Frank use his skills to avoid the pitfalls of the trigger-happy revolutionaries and ride off into the sunset with Beatriz? The first part of the movie - the First Blood part - is actually really good. It has some narration from Savage and seems like a sensitive tale with good character development. Then it goes from subtle to standard fare. The second half is boring and bland. It truly is a movie with two faces: the first half interesting and worthy and the second which is a slog that runs out of steam. But perhaps the most egregious problem is that the movie is called "Soldier's Revenge" but this soldier gets very, very limited "revenge". It really makes you wish the first half of the film played out more naturally. Maybe they figured if they did that, it would be too close to First Blood, but so what? It's not exactly the same. They tried to be different, but simply fusing two types of plots that have been done before together doesn't make a movie original, unfortunately. On the good side, besides the first half, Savage puts in a nice performance and he is one cool customer in those trademark shades. The movie also sports some quality cinematography and looks great. Sadly, the movie is hampered by some clunky ADR and some voices seem off or don't match, whatever. Director David Worth is well-versed in junky cinema and it seems during the movie his career is getting junkier and junkier. 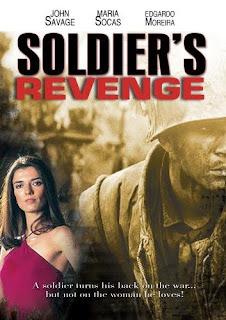 Released on TransWorld entertainment on VHS in the U.S. in the classic big-box, Soldier's Revenge goes off the rails (in a bad way) after an impressive first half. 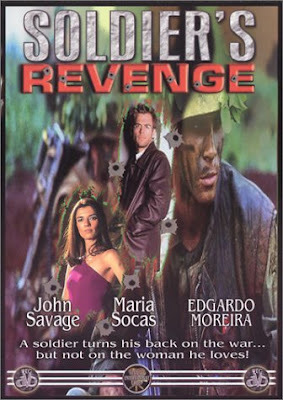 The idea of John Savage as the hero intrigues me. I've always seen him more as the sleek, sophisticated baddie. Based on your review, though, it doesn't look like it's one I should rush out for. It is a good idea, and he puts in a decent performance...but the movie around him falters. 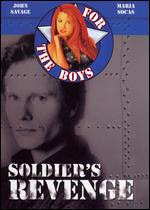 Maybe there is a better movie out there with Savage as the hero. Also thanks for following us buddy! I remember watching this on its Eiv video. I liked at the time. I liked at time and I liked John savage as an actor in films like The Deer Hunter and Salvador. There another film on the video trailer is Octavia which looks interesting. John Savage is always good. This was a bit weak though. Will have to look into Octavia.